Your pal Bill Pronzini likes this one the most if I recall correctly his article on Clason in 1001 Midnights. Not at home now so I can't verify it. 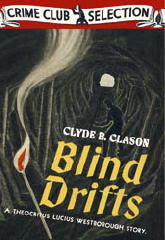 This book was to be my second post on my blog about Clason, but you beat me to it. Now I'll have to write up the one book that will probably never be reissued as it turns out it is the scarcest of all the Clason books -- THE WHISPERING EAR. I found a copy on eBay ages ago for a very fair price. Maybe one fo the few left out there. I've been meaning to do one on him as well. I wonder why Whispering ear is so rare, it appeared between Tibet and Minoan? There's a review of The Whispering Ear on the GADWiki and the reviewer described it as atypical for the series, with a small part for Westborough, which may explain its rarity.